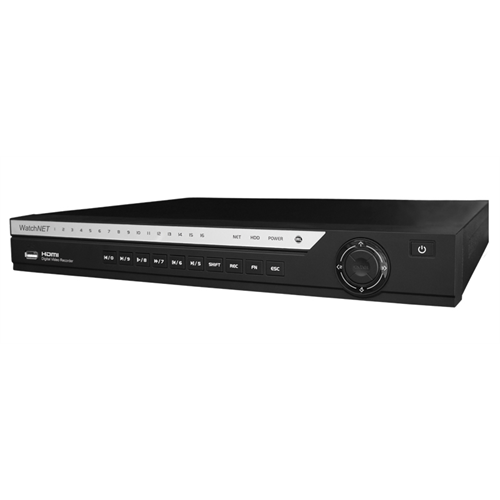 The EVI-0821-2T from WatchNET is a versatile Pentabrid DVR which can run HDCVI/XVI, TVI, AHD, CVBS and IP cameras. This unit can support up to 8 channels for analogue cameras and an additional 4 channels when using IP cameras for a total of 12 channels for IP. Full HD footage is transferred over UTP or Coax cable and using H.264 video compression technology, the DVR ensures that it stores the highest quality footage possible at the most efficient size. This unit comes with a pre-installed 2TB hard drive. It can house 1 hard drive up to 6TB. While it is always best to pair WatchNET DVRs with WatchNET cameras, the EVI-0821-2T is ONVIF compliant and will work with ONVIF compliant cameras from other brands.